First, a big thanks to Ranger Tim for suggesting this hike. It exceeded recommendations and I thoroughly enjoyed it. I went by Warnock and picked up my permit the morning of January 16, it was very foggy. By the time I got out to the Hoodoos, most of the fog had cleared off but I was able to get some pretty cool photos of the hoodoos with the remnants of the fog. 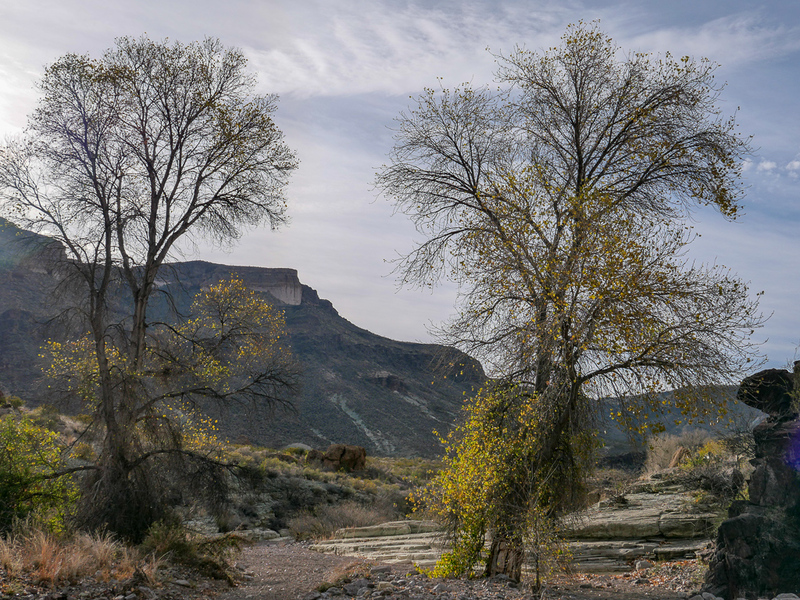 Tapado Canyon is just west of the hoodoos. 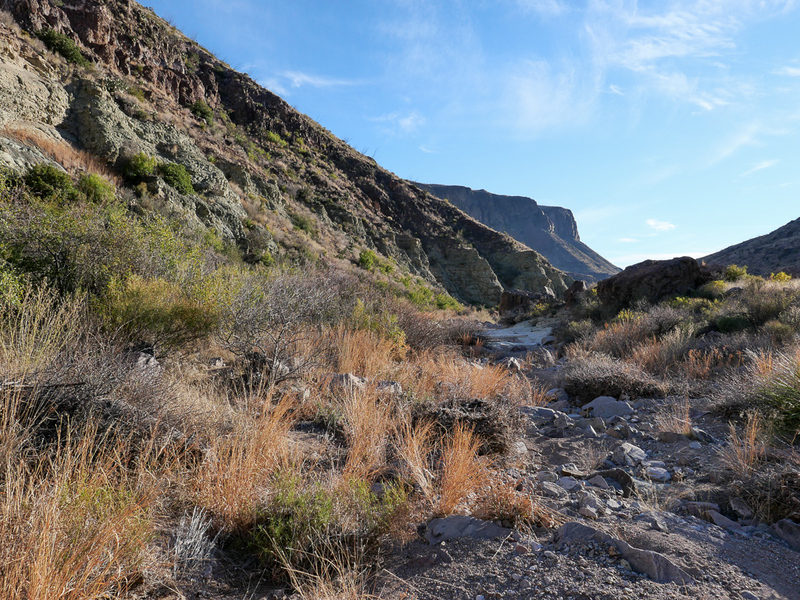 There is a driveway on the south side of the road with a gate to Tapado Canyon. I parked my vehicle there and left it unlocked to spare any potential thieves the trouble of breaking out my windows. It was about 9:30 when I finally got started. 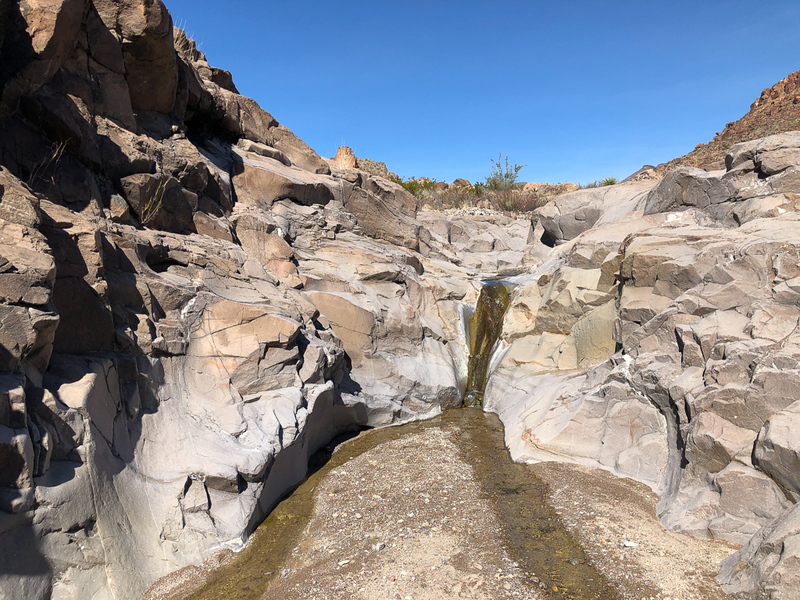 The whole hike is in the bottom of the wash. Because it is the soft gravel/silt of a wash, hiking is a little more difficult than hiking on a hard trail, but it’s not too bad. Unlike a lot of washes, there was no brush to contend with. 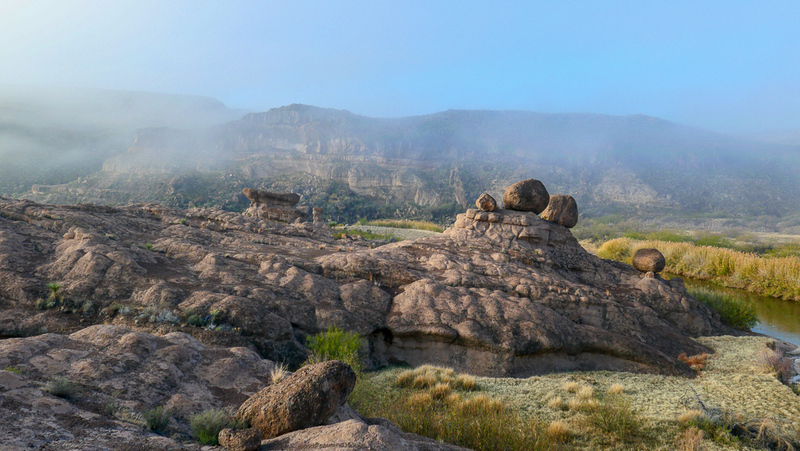 You are immediately greeted with awesome views and tall canyon walls with a variety of colors in the rocks. At about a mile and a half into the hike you come upon your first spring. I would estimate at least a couple of gallons per minute. For the next 3 miles there were a number of springs. I don’t know if they were actually springs or just the water going below the surface of the creek bed and coming back up. Either way there was plenty of water. 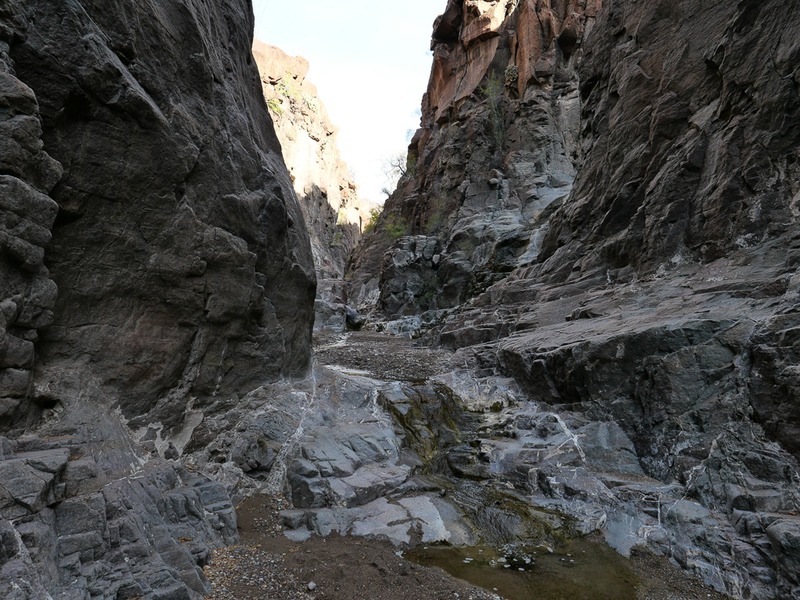 At about 4.5 miles, the canyon narrowed to a slot canyon and the last spring(s). 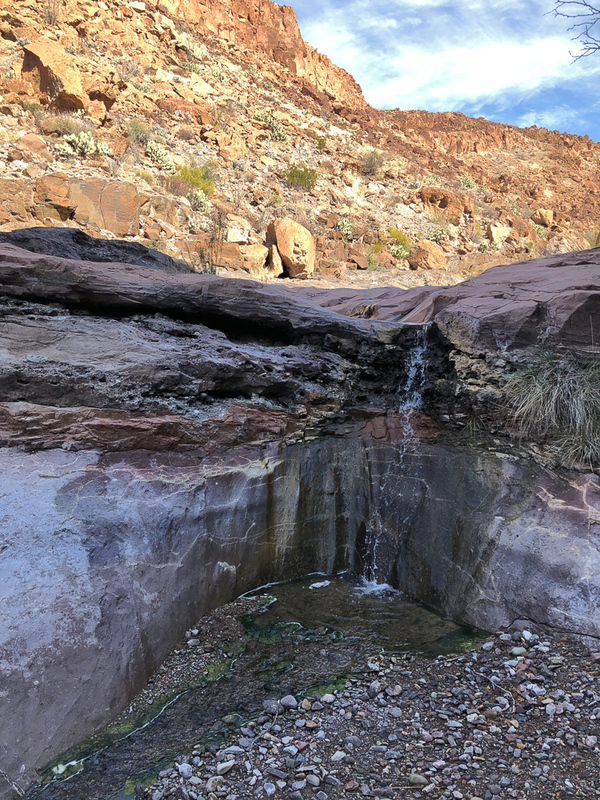 The canyon was really neat and in addition to the water in the stream bed, a small spring emptied from about 15 up on the right. 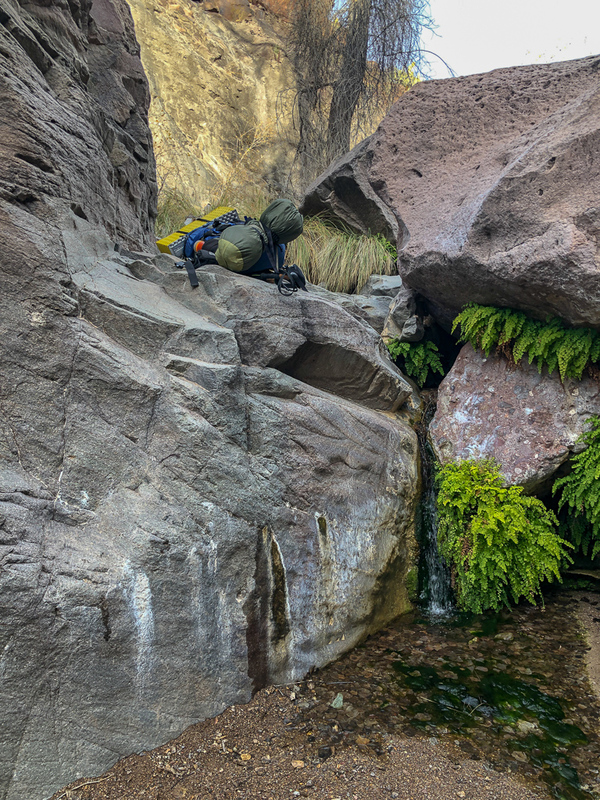 Near the upper end of the canyon there is a 10 foot climb that required me to take my pack off to get up. 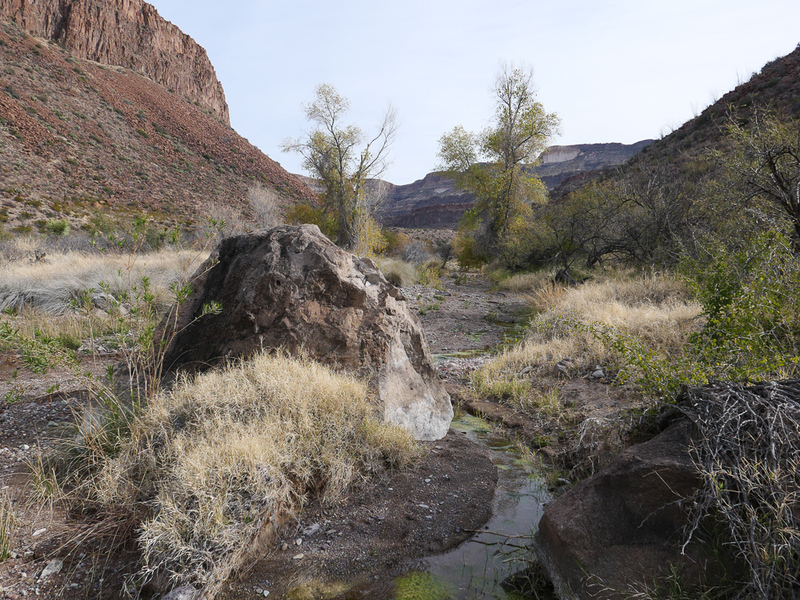 Shortly after exiting the canyon, the springs ended. I hiked for another three miles before encountering any water. Along the way the views continued to be awesome with a variety of colors. Towards the upper end, there were more large rocks to negotiate. Also, although you don’t realize it because it’s gradual, there is a continual climb. By the time you get to Oso Spring you will have gained 1200 feet. 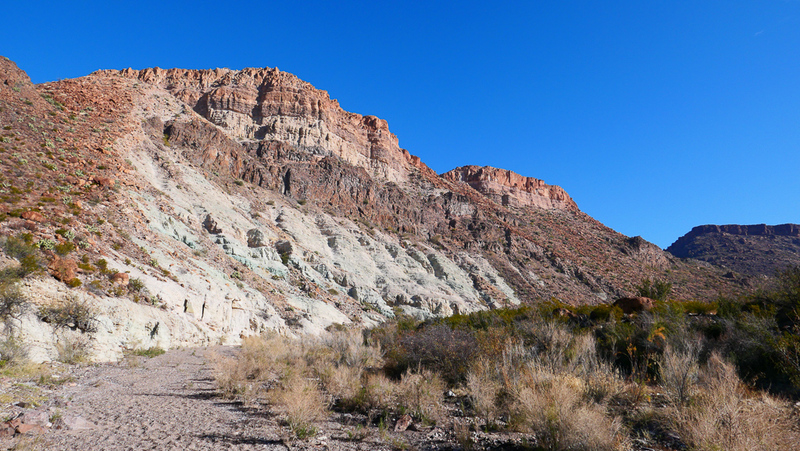 At about 7.5 miles, the canyon narrowed as you approached Oso Spring. At this point, things got a lot more difficult. There were boulders to climb over and lots of tall grass. I may be paranoid, but in West Texas snake country I’m a little bit uneasy putting my feet down where I can’t see them. Oso Spring itself was somewhat anticlimactic as it wasn’t well defined and surrounded by high grass. 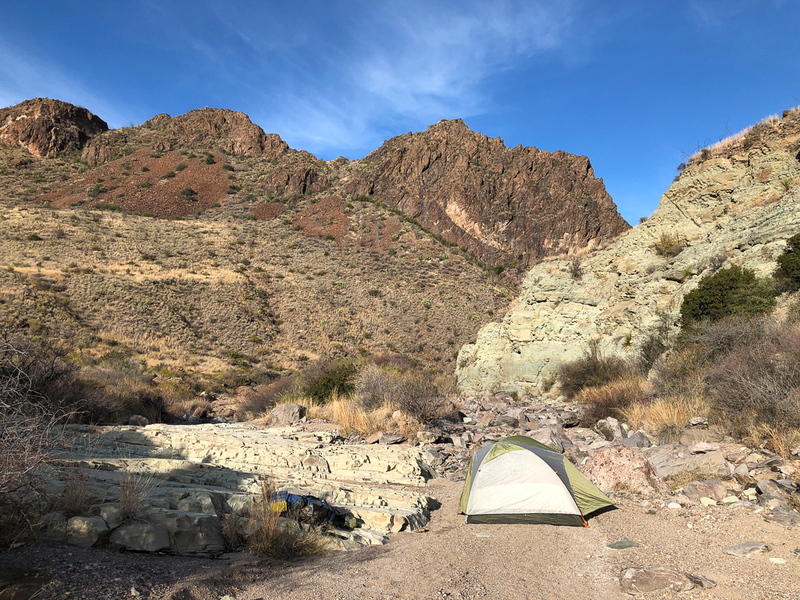 I hiked to below the spring to where I planned to camp but the canyon was narrow which would have made for an early sunset and late sunrise. So, I filled up my water bottles and hiked downstream another half mile and spent the night. The next morning I hiked out to the same gorgeous views. About ¾ of a mile from the end there is a jeep trail on the map. I followed it so you don’t have to. 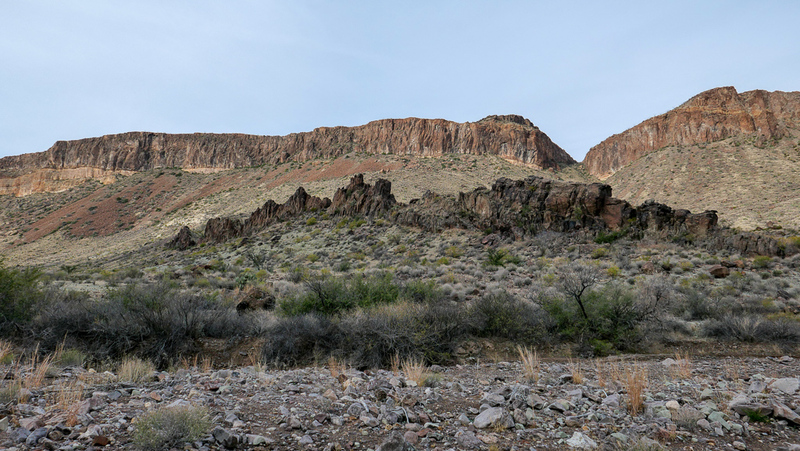 It takes you up out of the arroyo and you miss all the great rock formations. I don’t know why this hike is not more popular. Great scenery and lots of water. I don’t know if the springs always flow like that but you could have started the hike without any water and just filled up along the way in and out and you would be covered. 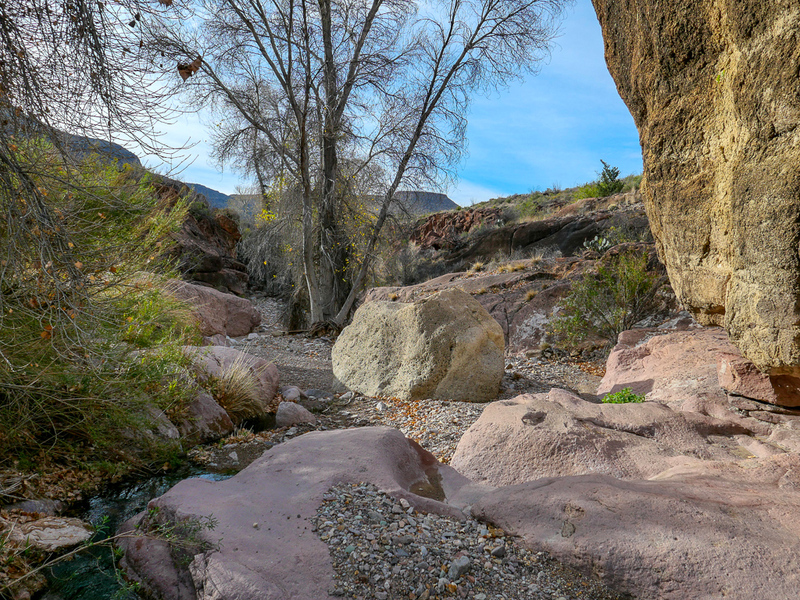 You could also do as a day hike and just hike in 4.5 miles to the slot canyon and see most of what Tapado Canyon has to offer. I definitely plan on doing again some time as a day hike. Beautiful stuff and thanks for sharing it. Looks like a great hike! I am flabbergasted. Prettiest landscapes I’ve seen in a long time! I've been excited about this hike since Tim mentioned it, even more so now! Thanks for the report and great pics. Its on my list for my next trip later this year. Wow. Top notch. Great pictures. Looks like water was not a problem. That first one is a calender nominee! 2020! I’ve peered down into Tapado from the edge of Upper Guale and wondered what it was like down there. Finding out would have carried me comfortably far from the ice chest. Frankly, sir, you shame me.